From the tumbling walls of Jericho to a Jewish girl who became the queen of Persia, the historical books of the Bible are intriguing and unquestionably fascinating. 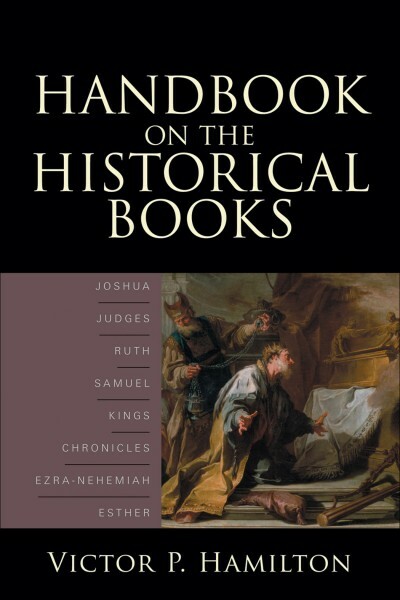 In Baker Handbook on the Historical Books: Joshua, Judges, Ruth, Samuel, Kings, Chronicles, Ezra-Nehemiah, Esther, veteran Old Testament professor Victor Hamilton demonstrates the significance of the messages contained in these biblical books. To do so, Hamilton carefully examines content, structure, and theology using rhetorical criticism, inductive Bible study techniques, published scholarship, archaeological data, word studies, and text-critical evidence. Hamilton details the events and implications of each book chapter by chapter, providing useful commentary on overarching themes and the connections and parallels between Old Testament texts. Using theological and literary analysis, this comprehensive introduction examines historical issues, attempting to uncover and discover their thrust and theological messages. For those who wish to do additional research, each chapter is appended with a bibliography. Undergraduate students of advanced biblical studies will find this volume enlightening and helpful as they forge their way through the historical books, and pastors will find useful insight for their encounter with and exposition of this portion of Scripture. Victor P. Hamilton (PhD, Brandeis University), now retired, was professor of Bible and theology at Asbury University in Wilmore, Kentucky, for more than thirty-five years. He is the author of a two-volume commentary on Genesis, Handbook on the Pentateuch, and Handbook on the Historical Books.